The Simplex ATR Imager provides a cost effective method of improving Infrared Microscope performance. The Imager optic of Germanium (Ge) enhance magnification and spatial resolution. 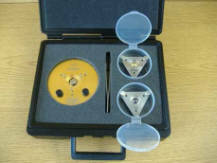 By contacting the sample directly, the optic becomes a Solid Immersion Lens (SIL) and the diffraction limit of the infrared light is improved by the index of refraction of the material which is 4x with Ge.The optics are broadband antireflection (BBAR) coated for improved throughput in Mid-IR. 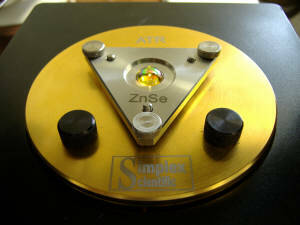 The ZnSe optic allows direct visual observation of the sample.